Simple-Fast-Effective-Point and Shoot. When you boil it down, those are the advantages of a red dot sight. And that's what the SPARC AR delivers - all in a durable, lightweight, compact and ultraclean package. Digital rear-facing controls for power and dot brightness offer quick access and are viewable from the shooting position. 2 MOA dot diameter promotes precise point of aim. Automatically returns to last dot intensity used when powered up. Unlimited eye relief and parallax free, the SPARC AR gets shooters on target fast. Waterproof, fogproof and shockproof for ultimate durability. Unit automatically shuts off after 12 hours to prevent accidental battery rundown and operates using a common AAA battery. Duty rifle - home defense - recreation, the SPARC AR is built to handle all your red dot needs. 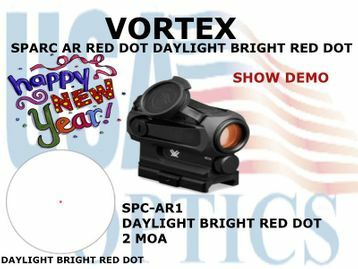 DAYLIGHT BRIGHT RED DOT - The daylight bright 2 MOA dot is fast and easy to use. Choose among ten variable illumination settings - the lowest two settings are night-vision compatible.